2011 was a banner year for Lenovo. This international tech company was crowned the #3 global PC maker, rolled out a snazzy new brand campaign (have you seen its For Those Who Do ads? 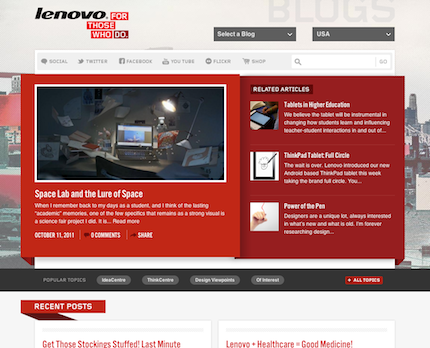 ), and partnered with Viget to launch the new Lenovo Blogs and Social pages. Their dated designs no longer aligned with the brand's message or high-tech look. It was difficult to make quick edits to the site and to manage so many authors. The Blogs section was divided into nine separate, ambiguously-named blogs, making it difficult for users to find relevant content. To tackle problem #2, we built the site using the ExpressionEngine CMS. Now, the Lenovo team can quickly jump in to the back-end of the site to manage blog content, and each contributing author gets his own account with unique permissions to access the content areas relevant to him. 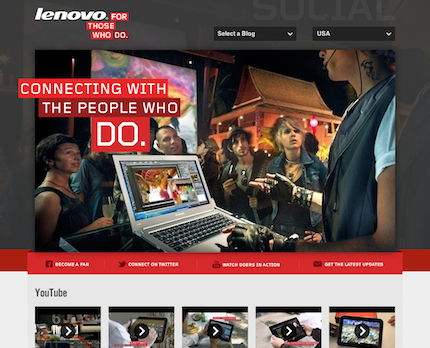 We also set up easily curated social media feeds and different languages for Lenovo's worldwide audience. We addressed problem #3 by reorganizing the Blogs structure. We created a new tagging schema that de-compartmentalizes blog topics and makes it easier for users to find content. Now, users can click through all blog posts in one place; plus, they can filter by topics, products, recency, or popularity. Such a high-tech, high-energy company needs a web site that can keep up with it, and the new Lenovo Blogs and Social pages are certainly up to the task! We hope they serve Lenovo well, and many thanks to Erik, Nano, and the rest of the team for a fun, successful project!